While Newegg has long been a go-to online retailer for a large number of electronics shoppers, for some consumers the site was lacking the expedited shipping and other perks offered by the Amazon Prime service. 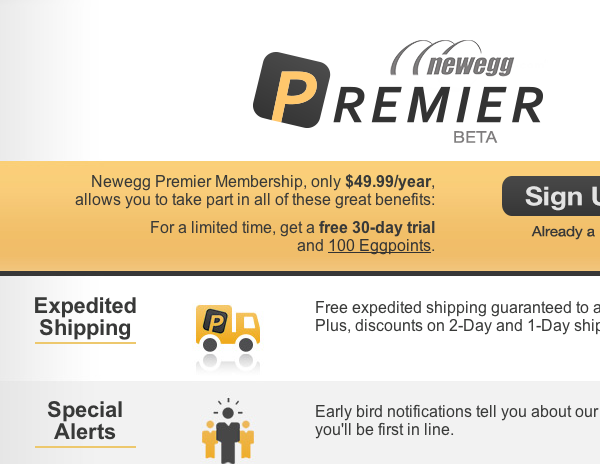 This week, Newegg finally dipped its toes into the premium subscription service pool with Newegg Premier. The service goes for $49.99/year, $29 less than what Amazon Prime members pay annually. Of course, the Newegg plan doesn’t include a library of streaming video content. Which may be just fine with shoppers who primarily enjoy Amazon Prime’s expedited shipping and have no use for rewatching Under the Dome or Downton Abbey online. The Newegg deal guarantees delivery in up to three days, one day longer than the timeframe for most Amazon Prime shipments. It also allows for free returns with no restocking fees. The announcement of Newegg Premier makes no mention of a minimum order amount, which may also be of interest to Amazon customers who are displeased with that retailer’s recent decision to raise the minimum qualifying purchase amount from $25 to $35. The Premier shipping also seems to extend to a wide range of products. It’s not available on absolutely everything from Newegg, but when we clicked around the site looking to find the limits of the offer, we found Premier eligibility on everything from a $2.47 cable extender to a $3,800 gaming laptop. Only time and experience will tell if Newegg Premier lives up to the shipping and service promises it makes. We imagine that we’ll be hearing from some of you if the retailer fails to meet expectations.